I spent this month mainly with work on the next row of wooden seed boxes, adding new herbs to the set and reading up on them. The central theme this time were summer herbs (with the summer solstice in mind), which are sown in spring or early summer, such as poppies, cornflower, chamomile, evening primrose, yarrow, viper’s bugloss etc. Then I paid attention to Harold Roth’s book “The Witching Herbs” (signed copies available here), and included seeds for the magical herbs discussed there. Besides these I added some endangered plants such as the wonderful centaury and plants that are in decline, such as the field larkspur. With wood betony and motherwort there are some new old, forgotten about healing herbs joining the series. Along with adding more new herbs I also updated the sowing tables and added info texts for each. Further, my attention was drawn to the Euphorbiaceae plant genus. Last year I had been pointed to the spurge as part of a Martial incense recipe. I started researching but could not pinpoint which type of spurge was meant. There are many plants in that genus, which is found in large diversity all around the globe. But which is the one most relevant in Western medieval / renaissance magic? By chance and when searching for spurge seeds, I came across a seller on eBay who just mentioned randomly that the caper spurge (Euphorbia lathyris), with its impressive size, poisonous milky sap and auspicious shape, was the plant famously believed to break hexes and ward of witches from one’s home…. Well, here we go. It is now added to the selection of poisonous herbs coming with the boxes and I can’t wait to grow it myself. What more? I finished and shipped the last of my “Poisoner’s” seed boxes. I will now overthink the concept and design for this one. My shortage of henbane last winter led me to sow new henbane, which resulted eventually in hundreds of little plants of black, white and the rare Egyptian henbane! These have now been separated and planted in trays of 24 each + 1 mixed tray. The temperatures are still low and even though it did not actually freeze again, it is too cold for the small plants (the test tray doesn’t seem to like my outdoors experiment on the window sill). I am therefore keeping the trays with the white and the Egyptian henbane indoors, together with purple Indian datura and several moon vine plants. The tray with the black henbane seedlings stays in the unheated greenhouse. So long, I wish my followers a Blessed Walpurgis! Wuth only few days left until the Winter Solstice, I am excited to share my next plant riddle with you! This time the herb I’m looking for is not a poisonous one. It is a classic healing plant, which belongs in any herbal apothecary. A giant in the garden, its name relative is associated with an adversarial hero, who helped man and offended the gods. Which is the plant in question? Fennel (Foeniculum vulgare) is a wonderful and mighty plant in the garden. It is for example a nectar source for hover flies. Hoverfly larvae feed on aphids (one hoverfly larva may devour as many as 700 aphids during its development) and thus are very useful creatures in the garden, providing long-term protection for infested plants. Fennel seed is a remedy against all sorts of digestive disorders, both in man as well as animals. A quick first aid for young birds that have fallen out of their nest and occur starved is dextrose/honey solved in fennel tea. Birds in the wild love to eat the seeds, hence another reason for making fennel a constant companion in your garden. My fennel plants are 4 years old and come back every year. (Who said fennel was biennial?) They are quite the sight, get over two meters tall and always remind me of the fire Prometheus stole from heaven and brought to earth for mankind to master… (tbc that myth applies to Ferula communis, but our common fennel can be viewed as worthy substitute). The sulfur yellow flower umbels also make for a nice contrast with the dark green leaves of monkshood and yew. 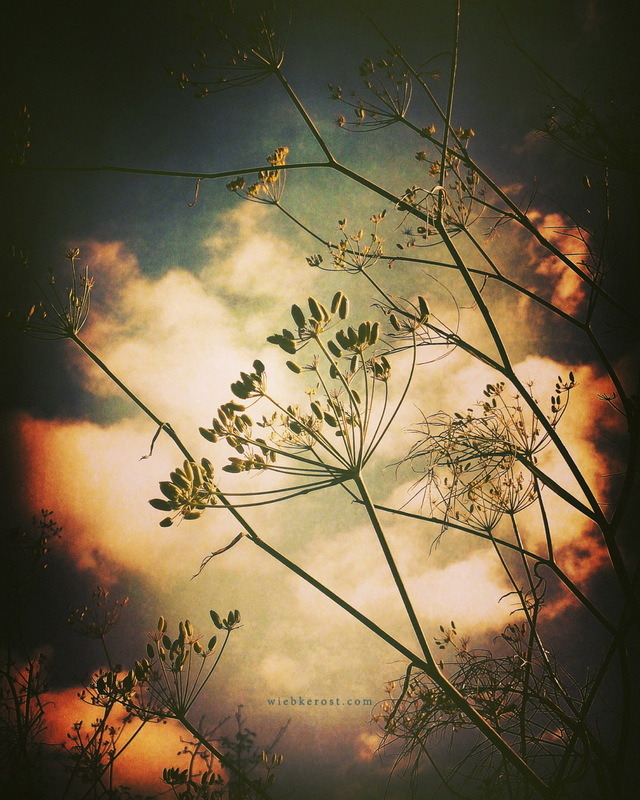 Sometimes I spend a moment in the sun and just watch the fennel sway in the wind… I perceive it as an ultimate summer/air plant, which also has the power to clear a chaotic mind as well as inspire artistic vision. The seeds I have here are VERY aromatic, sweet but also with a strong camphorous note.They would make a fine addition to prophetic incense blends as well as oils and decoctions. E.g. I love to sip some fennel tea in the evening and when my mind feels tired or scattered, as it brings back focus and clarity. Of course you can also sow them. Now is a good time to harvest fresh ripe fennel seeds and sow them directly.